Week 13 : It’s a shrimp! According to Babycentre my baby looks more or less like this now, and is about the size of a medium size shrimp. After looking at many many pictures of shrimps to find this one I am now craving shrimp, sort of, I just have to remind myself what they smell like and then I very suddenly uncrave it again. 😛 After “missing out” on the first few months of morning sickness I now have it in spades – all hours of the day – but especially at night. I find that if I try to stick to eating cold things, vegetables, cheese and fruit and only the minimum of meat I feel better. I am looooooooving Strawberry Nesquick at the moment. 😀 and french fries, any kind but my favourite is the ones from Steers. We had our second scan yesterday, the doctor did the 12 weeks scan even though we are 13 weeks along. It’s fairly elaborate since they check for all kind of things like downs syndrome, spinal problems and they also check to see if the nose has formed properly. So far everything looks A-okay thank goodness. I always get so anxious before a scan. It feels like an exam that I have to pass, for which I can’t really study. After the sonar I had to go for blood tests as well, doc says that they can pick up about 85% of problems with this test. the nurse at the lab had some choice phrases for my medical aid because they’re not covering any of the pregnancy expenses. It’s an expensive hobby this baby making. Just the tests and scans from yesterday alone was R1600 on their own. I still have to get the quotes from the hospital, anaesthetist and the paediatrician for the delivery but rough estimate for the delivery (which they also don’t cover) is about R20 000 to R30 000 depending on how it goes and if anything goes wrong. The strangest side effect I’m feeling at the moment is still the weird and very vivid dreams I’m having – almost every night! Luckily none have been nightmares so far, just very very strange. Last week I told you about the Tuna/Sardine dream? Well, one night this week I dreamt that I worked for two leprechauns as a bar-lady in a pub they owned in old Melville. Their names were Ham and Maybe and they would appear whenever you even so much as thought about them. After I worked their for a couple of months they sent me home with a handbag full of Kruger Rands. Nice. 🙂 The next night I dreamt that my mom had a closet as big as our house (HUGE) half full of evening gowns in almost every colour and shape you could imagine – very pretty. The next night I dreamt I was at someone’s birthday party, a complete stranger to me actually, all I remember is the guy had red hair. And I had to get him to wear a birthday hat made out of a coconut husk – I had the matching jacket for some reason and it was a challenge of some sorts. I eventually managed, but I woke up quite tired cause he didn’t make it easy at all. Pre-pregnancy I hardly ever had dreams, or if I did I never remembered them – so this is a big adjustment for me. The whole world is pregnant at the moment, or that’s how it feels anyway. Personally I know 8 other pregnant ladies, these aren’t people I met after I got pregnant – they’re just my regular friends who also happen to be. This week I found out about one more! TGC’s stepmom phoned me yesterday to share the news with me that her daughter is also preggers. She and her hubby have been trying for a while so I was really happy for her and called her at once to congratulate her. She’s about 4 weeks now…wow, that feels like a life time ago to me! I hope she stays healthy and happy throughout. 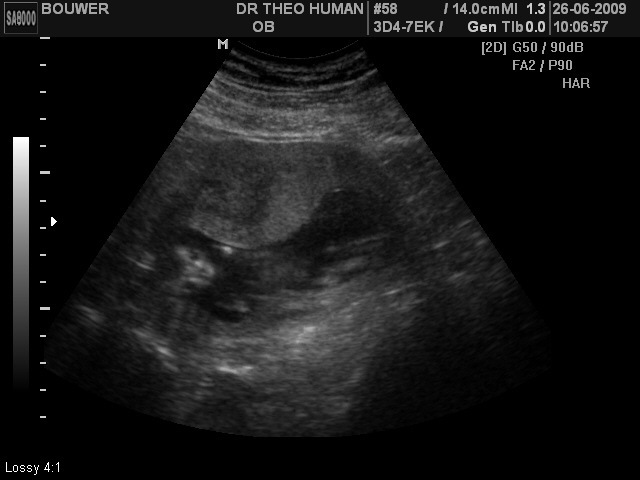 Here’s a couple of pictures of our scan from yesterday. I got a video too, but it’s in a .mvl format and you can only play it with the sonar machine – which I don’t have. (pffft – silly way to do it I think). Oh baby so does not look like a shrimp! LOL about the KR’s they would be handy right now. Spear, 😆 What does she say about that? Jeanette, you’re telling me. A handbag full of those would go a looong way. Just thinking about it makes me want to go shopping. hmmm…from fruit to seafood. i loved all my scans. it was so exciting. awwww…enjoy, lucky lady. I didn’t expect to move from vegetables to seafood, but I guess that’s OK. I suspect we just might move to sporting goods at some point. I can’t imagine leprechauns paying a fair wage. I heard they’re greedy. Thanks Rebecca! 😀 Yeah, I don’t know how they come up with these food items. 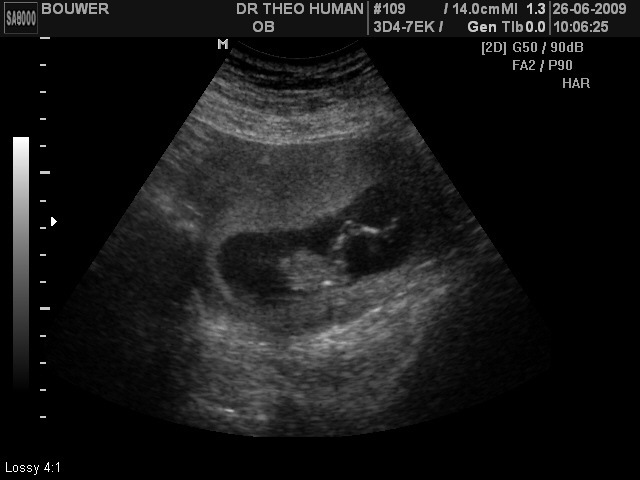 loved going for scans and getting to see the baby. Exmi, thank you. 🙂 Yep, I love the scans too. It’s nice to be able to look in at what your kid is up to. Marvels of modern medicine. I’ve always had weird dreams, but yours sound really entertaining. Ham and Maybe? Hilarious! Tamara, usually I don’t dream – so this is a big adjustment for me. Initially I wanted to rush out and get a dream book or something, they’re just so vivid! But my cuzz assures me this is all part of the process, and then she told me about some of hers which are even weirder than mine. Hey Squeeza, sorry about the morning sickness. Try Asic, it worked wonders for me. Hey Tammy! 😀 I’m feeling much better now, thanks. But I’ve got those Asic pills handy just in case it comes back again. Are you talking about the movie that I’m hoping you’re talking about? I’ll call you a bit later – I’m sure not everyone wakes up at 6 on a Saturday…then we can make a plan.